"Dostoevsky" redirects here. For the surname, see Dostoevsky (surname). 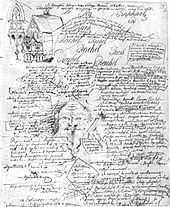 This name uses Eastern Slavic naming customs; the patronymic is Mikhailovich and the family name is Dostoevsky. 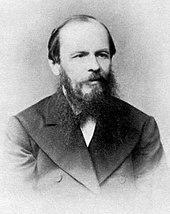 Fyodor Mikhailovich Dostoevsky[a] (/ˌdɒstəˈjɛfski, ˌdʌs-/; Russian: Фёдор Михайлович Достоевский[b], tr. 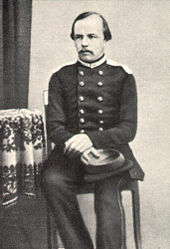 Fyódor Mikháylovich Dostoyévskiy, IPA: [ˈfʲɵdər mʲɪˈxajləvʲɪtɕ dəstɐˈjɛfskʲɪj] ( listen); 11 November 1821 – 9 February 1881[c]), sometimes transliterated Dostoyevsky, was a Russian novelist, short story writer, essayist, journalist and philosopher. Dostoevsky's literary works explore human psychology in the troubled political, social, and spiritual atmospheres of 19th-century Russia, and engage with a variety of philosophical and religious themes. 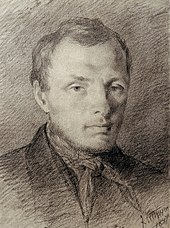 His most acclaimed works include Crime and Punishment (1866), The Idiot (1869), Demons (1872) and The Brothers Karamazov (1880). 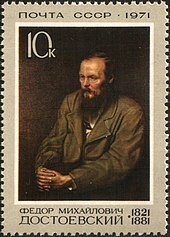 Dostoevsky's oeuvre consists of 11 novels, three novellas, 17 short stories and numerous other works. Many literary critics rate him as one of the greatest psychologists in world literature. His 1864 novella Notes from Underground is considered to be one of the first works of existentialist literature. 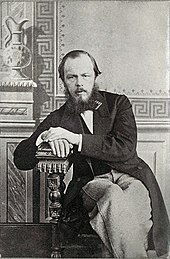 After his release on 14 February 1854, Dostoevsky asked Mikhail to help him financially and to send him books by Vico, Guizot, Ranke, Hegel and Kant. 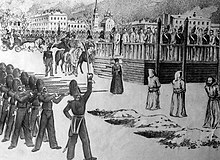 The House of the Dead, based on his experience in prison, was published in 1861 in the journal Vremya ("Time") – it was the first published novel about Russian prisons. 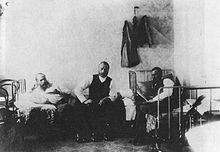 Before moving in mid-March to Semipalatinsk, where he was forced to serve in the Siberian Army Corps of the Seventh Line Battalion, Dostoevsky met geographer Pyotr Semyonov and ethnographer Shokan Walikhanuli. 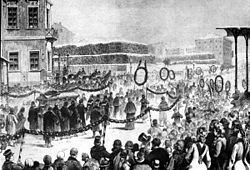 Around November 1854, he met Baron Alexander Egorovich Wrangel [de], an admirer of his books, who had attended the aborted execution. They both rented houses in the Cossack Garden outside Semipalatinsk. 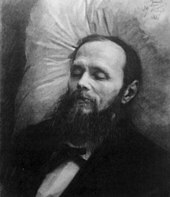 Wrangel remarked that Dostoevsky "looked morose. His sickly, pale face was covered with freckles, and his blond hair was cut short. He was a little over average height and looked at me intensely with his sharp, grey-blue eyes. It was as if he were trying to look into my soul and discover what kind of man I was." ^ "Russian Postage Stamps of 1956–1960". Soyuzpechat [ru]. Retrieved 5 November 2017.